The battle field had been set for the first two contestants. It was a vast peice of land with an abandoned city serounding the God. The wood was old and the buildings that once stood high now crumbled to the ground. The village was as large as Konoha or Suna but as abandoned as a ghost town. Standing tall on the highest building of the village a dark silhouette could be seen. His spiky orange hair blossomed in the dark battle field, red clouds beaming from his black Akatsuki cloak. Standing there with absolutly no emotion and standing perfectly strait, Pein performed a singal seal. Suddenly from the dark skys above a shawer of rain started to pour down onto the entire battle field engulfing the area within his jutsu. Sakura had just entered into the set battle feild for her first match in this "tournament". It was an abandoned city, much like Konoha in size. It was an easy place to get lost in. Knowing that she was matched up with the one and only Akatsuki leader, she knew she did not stand a chance. The thought of giving up crossed her mind every second that passed. Walking around in the city, she was heading towards the building that her opponent was perched on. Once reaching the building and looking she looked all the way up at the akatsuki member as she was already sweating from how nervous she was. " Lets get this party started" she mumbles as she closes her right fist as it started to randomly rain. All of a sudden Sakura's fist is engulfed by chakra as she yells thrusting her fist into the building Pein was standing on. The building started to crack around her punch and so on, and within seconds the building would be falling down to the ground along with Pein. Not to get crushed, Sakura was jump away ontop of a house like building only with half of its roof to wait and see what has become of Pein. The God would remain still and tall ontop of the highest point of the battle field as his rain began to flush down the village. As soon as the rain touched the pink hair of his opponent the Akatsuki leader knew her exact location. "Hmph, eager to begin." Knowing that Sakura stood right beside his building, suddenly the structure started to shake as it soon came crumbling down to the ground. Instantly sending chakra into the soles of his feet with ease, Pein would remain on the broken building as his crumbled to the ground. Jumping off of massive peices of the building as they fell Pein made sure he remained at the top of the crumbling building. The whole tower now fell to the ground sending out a large cloud of smoke and dust cloaking Pein's location. The rain would provide Pein with Sakura's position making it easier for him to attack his prey. With unimaginable speed, Pein swiftly dashed out of the cloud of smoke almost like a black blur. Apearing right beside Sakura, Pein would swiftly swing his left leg sideways thrusting the sole of his foot right into Sakura's side. Hitting her with tramendess strength, the female would instantly be sent flying off to the side towards another building. Standing up strait once more looking right at the Konoha nin with his Reingan, Pein said out loud "Today, you shall know the true meaning of pain." Summery: I knew where you were because of my rain. As the building fell Pein jumped off of the falling boulders staying at the top so he wouldnt be crushed. Once the whole building fell a cloud of smoke rose and gave him cover. Pein then dashed out of the smoke as fast as possible apearing beside Sakura and kicked her away. As sweat dripped from the side of Sakura's face, it was now coverd by the rain she was showered in as her pink hair was hanging down her face but the Konoha head guard help keep it out of her face. As the smoke engufled part of the area, Sakura's eyes opened wide with fear when she realized Pein was standing right beside her. She did not even have time to turn her head as she got kicked with a mass amount of strength getting knocked right off of the roof top smashing into a building cracking the wall falling onto the ground. Slowly getting back up holding the side she got kicked on with her hand, she looks up at Pein hearing what he said. Giving him a face filled with anger, she says to herself " im not goning to go down without a fight!" as she brings both her hands up as chakra is formed around both her fists. Yelling as she swings her arms towords the ground smashing her fists into it. Having an earthquake effect the ground starts to crumble as it reaches the building Pein was standing on also making that one fall to the ground. Sakura then dashes full speed towords Pein while the building was falling and would punch him right in the face with all her mite. summary: got hit. Hit the ground causing a mass earthquake effect also making the building crumble. While it was falling Sakura dashed towords Pein going to punch him in the face with all her mite. Pein watched as anger struck the little girls face. She was already losing control and this would prove to be even more fatale for her. His ringed eyes would slightly open wider as the little girl was stronger then she seemed. Her strength would shatter the ground bellow her grip causing the ground the tremble and shake. Sending out a wave of destruction as the buildings around her fell to bits so did that of Pein's. Jumping up high into the air so he wouldnt have to deal with the bone crushing bolders tumbling to the ground bellow, his ringed eyes would look ahead of him as Sakura soared through the air aproaching his position. His facial expression would remain completly calm. Her movements were easy to read as their wasnt much for her to do within the air, and the way her body was position as she moved forward made her attack almost to easy to see coming. Watching her fist bolt forward towards his face, Pein would swiftly move his neck and some of his upper body off to the right side evading the incoming fist. Having just witnessed this little girls strength, one punch could be a fatale one. The instant Sakura's fist zoomed by Pein's face, the tip of a black blade would swiftly emerge from within his right sleeve. Thrusting his arm forward the black blade would peirce right into the flesh of Sakura's stomach punturing strait through her stomach. Stabbing out of Sakura's back would be the tip of the black blade. The minute it entered Sakura's body, the blade woudl begin to distort Sakura's chakra. Making it go crazy within her body now making it impossible to control and mold the slightest bit of chakra. Thrusting his left fist forward, the Gods hand would connect with Sakura's forehead knocing her right down towards the ground. Smashing into the earthquake torn earth from her previous attack, Pein would land on the rubble of the buildings that fell. Landing crouched forward looking strait at the female he said "Give up now, and I shall spare your pitiful life. If you dare continue, then my next move shall be the last of this childish battle." Summery; I jumped into the air when I saw the buildings fall and saw you coming for me. I dodged your punch by moving my head off to the side, then stabbed you with one of my black katanas. Then I punched you in the forehead hitting you down towards the ground. Landed and told you to give up. As Sakura soared threw the air going to punch Pein in the face, she knew it had no chance of hitting him. After all he was the akatsuki leader. Sakura was no idiot, she has proven to be quite smart. The instint her punch missed, with her free hand she pushed off of Pein own body pushing away from him. Landing onto the ground she spotted Pein holding a black blade that apeared out of no where. Watching Pein land in the rubble of a building, Sakura reached into her pouch as she heard pay give her the option to quit. Sakura had thought about if before and did consider it. But for some strange reason there was something inside of her makign her thrive for this battle, even though she had no chance of winning. Pulling both her hands out of her pouch, one held two small balls as the other hand held four kunais with papers attached to them. Throwing the two balls onto the ground infront of Pein, they would both explode engulfing him in smoke blocking his vision. Then throwing the four kunais into the ground within the smoke Sakura would send her chakra into the tags. Within seconds the four tags would blow up creating a masive explotion which would surley hit Pein. While this was going on Sakura would reach in pulling out a paper hiding it in her hand. Summary: Knowing it would have missed she got ready for it and pushed off of Peins body. Throwing two smoke bombs to cover your vision then threw four kunais strapped with exploding tags as they blew up. Pulled out another "paper" and hid it. Sakura had pushed herself off of Pein before he could strike her with his special black katana. Not even a quarter of the blade stuck out of his sleeve but it was still visible. Landing on the rubble bellow of the fallen buildings Pein not watched with his Reingan as Sakura reached down into her kunai pouch. Standing up strait and tall like before Pein said to the little girl "You have prooven yourself worthy for a shinobi of your age. But I'm telling you now, I have seen and delt more Pein then any member of your village will ever hope to witness. You cant hope to beat me, a God." But no matter what Pein said to the infidel before him, she never listined to the wise words that would spare her life. Looking down at the tools pulled out with his powerful eyes, Pein slowly raised his right hand and said in a low confident voice "Bansho Tenin." Instantly after those words were spoken before Sakura could even throw her smoke bombs she was feircly pulled forward towards Pein. Flying in towards the god at a fast rate, Pein extended the sword held in his other hand to its full length and thrusted it forward. The blade would instantly peirce through the center of Sakura's chest and come bursting out her back. Blood would start flowing out of his body as Pein swiftly snapped his hand to the side braking the sword keeping the rest of the blade within the girls body. As the sword instantly took effect Pein thrusted his left first forward smashing it into Sakura's just formed wound. Sending her tumbling across the rubble and left overs of the buildings. Still holding whats left of his black katana, Pein said "I gave you your chance, but you didnt seem to value your life. And now I'm going to take it away from you. For good." Lifting up his free arm Pein said "Shinra Tensei." Suddenly, the massive boulders of bricks and debree that serouned the two would launch forward strait towwards Sakura. Smashing right into the konoha kunoichi they would instnalty crush every bone in her body. The Akatsuki leader would stand there as he watched his jutsus take care of the enemy before him. Summery: I pulled you towards me before you threw your smoke bombs at me and stabbed you in the chest with my sword. Then I broke the sword off of you and punched you away from me. Once you were away from me, I used Shinra Tensei to throw a much of boulders of the building towards you which would crush you to death. Sakura was getting ready to throw her smoke bombs she felt her body shaking. Within seconds Sakura was beeing pulled by some myterious force, as if he was controlling gravity. As Sakura was flying towards Pein, she spotted his black sword. But what Pein failed to realize was that Sakura also had four kunais in her left hand. Sakura reached Pein in seconds as blood gushed out into the air. But it would not only be Sakura's blood that spilled, but Peins blood also. Sakura had thrusted the four kunais right into the part that connected his neck and shoulder. Blood would spill out of her mouth and fall on Peins cloak as she felt a disturbing feeling within her chakra system. Sakura got knocked away as she slide acorss the ground knowing that she could cause damage to him, she tried using her chakra, but it was not working. Slowly raising her upper body she came to the conclusion that it was the blade as he must have entered his own chakra into Sakura disturbing the flow. While Peins spoke about him sparing Sakura's live, she reached in behind her for the blade and with one swift momvement pulled it out yelling a bit in pain. Tossing the blade aside, she felt her chakra go back to normal. Setting the tags of the kunais in his neck/shoulder on fire, they would then blow up right there easily blowing up his head and shoulder. While this was happening Sakura would throw both smoke balls into the ground that she was holding and quickly flee as she jumped threw a broken window falling into the house. Putting her back up against the wall she put both her hands on her wound as a green aura formed over the wound as she says " I must not give up, no matter what happens." Sumarry: Stabbed the four kunais into your right neck/shoulder part, and when you hit me away and while you were talking she pulled the blade out setting the tags on fire blowing up right on you. The fled and hid in a building to start healing her wound. Pein sword had peirced through the flesh of Sakura, but as his fist flew forward aiming for Sakura's head, she had attacked him even after having been pulled with such force. The sudden shock of pain haulted the God's attack. Blood swiftly oozed out of the Akatsuki's leader. His body slightly moved back do to the contact. But his mind hadent been taken off of the battle and he was swift to react. Continueing on with his previous move now with anger, Pein added much more chakra into his attack. A huge wave was released from Pein and sent Sakura bolting away from him within the blink of an eye. The blast was so powerful it blew up the rubble of his village that serounded him. Standing tall and remaining completly calm, Pein would begin to talk when suddenly Sakura started reaching behind her back for the little peice of blade that stuck out. There wasnt much, but enough to be pulled out. Pein nodded when he saw this and activated the Bansho Tenin. Before Sakura could fully pull the blade out of her back, a massive brick wall from behind came bursting out of all the rubble and smashed right into Sakura's back. Smashing right into her with such force the brick wall would brake her entire hand and hit the sword back into her flesh. But the brick wall would continue moving forward at a high speed heading strait towards Pein. As Sakura came towards Pein like an a target and the bulls eyes was her wound, Pein through the dagger remains of his black sword into his left hand. The second this was done, Pein moved so fast he vanished off of his position. Apearing a few feet in the air infront of Sakura, the incoming wall would swiftly close the distance between the two. Thrusting his left arm forward with every ounce of strength he had, Pein stabbed the remains of the black sword into Sakura's right lung peircing it. Now standing on the fast moving rock, Pein would swiftly vanish off of it right when it hit another building bringing the whole thing to the ground. Pein stood ontop of another building that looked down at the one which had just fell onto Sakura. Slowly pulling the kunais out of his shoulder, and throwing them down towards the ground the God would look down at the females resting spot without saying a word or releasing the slightest bit of emotion. Summery: Still blew you away but with more force and started talking, but when i saw you reaching for the blade I activated Bansho Tenin which pulled a massive brick wall from behind you forward. It smashed right into your back braking ur hand and hitting the sword back into you. As you came forward I jumped towards you so you wouldnt somehow get off of the wall before I attacked you. I stabbed the left overs of the black katana into your right lung. Then I jumped off of the wall before it smashed into another building bringing the whole thing to the ground. I speared on another building looking down at the one I just made fall onto you and pulled the kunais out of me. As Sakura attempted to pull out the blade she saw that Pein nodded his head, and at that moment Sakura felt something smashing into her from behind which must have been a wall of some sort. As Sakura was flying towards Pein, there was only so little that she could think of. Crushing the two smoke balls in her right hand as the would explode easily covering Pein's vision of her. Because Sakura no longer no longer have vision either she knew that she would be smashing into somthing and she needed a way to brace herself for impact seeing as how she happened to get an arm broken. The first thing that came to mind was her legs. Putting her right hand into the brick wall to help her she would lift up her legs to brace for impact. If Pein would continue his attack, he would just smash right into Sakura's feet. If he were to move out then Sakura's feet would have help to brace for impact as shed smash into another building. Pushing the debree and boulders off of her, she needed a way to flee as she got up and realized that the blade had been pushed out onto the other side from the brick wall. As blood started to drip from her mouth, Sakura needed to flee quickly as she jumped into a pipe line which this city was filled with. Now that she was far enought in the pipe line, she would reach for the blade coming out infront of her and pull it out as fast as she could to make the pain short and sweet. But it was not very sweet for she was in a great deal of pain. Pulling out a bunch of exploding tags, she put them all around the pipe lines so if Pein happened to come in, he'd be a gonner. Grabbing some type of rapping from her pouch, she slowly started to rap it around her for she only had one hand. Once she had rapped it around her and stopped the bleeding, she walked further down the pipe lines to be sure she was out of Peins reach. Putting her right hand over her wound creating a green aura as she started healing her wound. As Sakura aproached on the incoming wall wich Pein pulled towards himself, there was a sudden explossion of smoke that engulfed the entire wall blocking hsi vision from Sakura. Being unable to continue his attack the Akatsuki vanished off of his currant spot so the wall wouldnt crash into him. Landing ontop of a rooftop of one of his buildings and pulling the kunais out, he would let them fall down towards the ground. The falling rain would wash away the blood the slowly soaked the shoulder of his cloak. Ignoring the pain of the wound in his shoulder, Pein watched Sakura forcfuly push her way through the rubble of the broken building then fell ontop of her. "She's still alive." He said with surprise. "She is truly staborn. Cant she see there's no chance of winning." Watching her with his Reingan, he watched as the female fled and ran into the many pipes that circulated through Pein's village. "Running wont help you. As long as your within the walls of my domain you dont stand a chance." Pein knew the pipe lines like the back of his hands and it would lead to Sakura's down fall. Vanishing off of the building which he stood on, Pein would apear on the ground infront of the opening of a pipe line. But not the same opening wich Sakura fled into. Knowing that she would sneak attack him with any means possible to so despritly win this fight Pein went to another opening located somewhere else within the village. "I dont have time for silly games. Its time I end this now." Slowly entering the mouth of the pipe, Pein would walk forward into the tunnles. All the pipes were connected as one system, so it wouldnt be to hard to find her. Turning a couple of corners and walking down several long and narrow pipe lines, eventualy Pein arrived at a long and large pipe. And at the end of this pipe was his Konoha enemy who was now healing her wound. Looking at the little girl heal herself, Pein looked down at the ground and saw his black blade lying there. Raising his free hand the blade would lift into the air and fly right into Peins hand alerting Sakura of his presance. Now holding a tiny dagger and blade Pein said "This place is my home. My village. I know this place better then I know myself." Not moving from where he stood, the God continued on and said "Tell me little one. What is it you fight for. Even when I would have spared your precious life you continue fighting a battle that cant be won. Why do such a thing. Your only inflicting more pain on yourself and when you die unimaginable pain will be inflicted onto your loved ones. Why dont you save yourself the stress and save me time and stop trying. A human like you stands no chance against someone like me. A God like me." summery; saw u run into the pipes so expecting that you would sneak attack me or sumting, I went through another Pipe. I then found you and pulled the sword that you pulled out of you back into my hand wich would tell you I was there. Then I spoke to you. Sakura thought she was safe and thought she would have enougt time to heal her wound. She had already managed to stop the bleeing. While she was leaning against the pipe line healing her wound she saw the blade she pulled out of herself dart off. Rapidly turning her head she sees Pein standing there holding the remains of his sword. "How did he find me?" Sakura asks herself as he says that this is his home and he knows every inch to it, thus putting Sakura to an even greater disadvantage. Still healing her wound while Pein talked, as she did was listen to what he had to say. This guy really talked alot bout pain. "This guy considers himself a god?" Sakura says to herself as she was still healing her wound. " You really want to know what i strive to beat you even if i dont stand a chance. Because your Akatsuki, its because of one of your members that made Sasuke's life horrible. And Akatsuki is the one going after Naruto for his tailed beast. So if i can take yuo down now, then it will all be over!" she yells removing her right hand from her wound closing her fist as she does a little hop punching the top of the pipe line with a chakra fist. The force of the punch was so powerful that the pipes started to crack, as everything around them started to cave in. As soon as Sakura landed back onto the bottom of the pipe line, she started running down the way she came in to avoid beeing caved in. Once she mad it out and back outside into the rain, she set of her exploding tags that she had set before causing mass explotion making even more of the pipes and all to cave in. Knowing it would not be the end of Pein, Sakura pulled out a kunai which had a little string with an exploding tag connected to the end of the string. Putting her back up against the wall of a building she watched and waited to see if Pein would come out. Wholding the two blades in his hands as he stood up strait the Akatsuki leader listined to the girls respons. Remaining calm and never changing his facial expression or tone of voice "Your reason are weak. Reasons such as those will never make you win against me. Wanting to destroy me because someone I know screwed up Uchiha Sasuke's life isnt a good enough reason to actualy have the abilities to kill me." His Reingan looked right into the eyes of Sakura as he continued "Your hopes of stopping me from gainning the 9 tailed beats are usless. And you are horribly mistaken little one. Taking me down wont change anything in your plans to save your friends. Sasuke will never go back to who he once was. He's made up his mind and I dout the likes of you can change it. And the 9 tailed beast will still be hunted down by my organizartion and you should know that already." Pein watched as Sakura jumped up to the ceiling of the pipe and swung her fist at it. Her powerful strike connected with the walls when suddenly everything started to come crashing down. Cracks swiftly spread across the walls of the pipes like wild fire while everything came crashing down like a waterfall. Watching as the Konoha kunoichi ran away, Pein simply stood still and watched as everything decended towards his position. But before anything could actualy touch him, there was a massive explossion of some sort of energy blowing everything away from Pein almost as if a miny nuk had just set off. Blowing up the whole tunnle including the section where Sakura had placed her traps, every peice of the tunnle was flying away through the village. So when Sakura activated her exploding tags the explossion would be seen in the distance. Pein now stood in a large crater deep within the ground as everything was perfectly smoothed out around him. The water from the pipes and the falling rain would soon flood the crater reaching up to his shins. Knowing exactly were Sakura was standing Pein would slowly walk up out of the crater and said "It ends here." Dashing towards her with mind blowing speeds, Pein headed strait towards her. But once he got within 15 feet of Sakura, Pein swiftly jumped into the air and through the window of the building that Sakura rested on. Seconds after Pein entered the building, the whole thing would begin to blow up from the inside using the Shinra Tensei once more. The whole building would blow up to peices and all of these massive peices of building would come crashing down onto Sakura. But Pein knew that this girl was smart and would be able to avoid such an attack. Using the rain to know her exact location, Pein would swiftly pounce off of the falling boulders and dashed right beside Sakura. Apearing beside the kunoichi of Konoha, Pein swiftly lifted his left leg smashing his shin and knee right into Sakura's gut. The mass amount of strength packed into the kick would send the female soaring through the air. As she did so, Pein swiftly swung his left arm turning it into a blur releasing the black dagger like blade strait towards Sakura's chest area. Sakura wa shocked when she saw everything fly away from Pein as he created a mass explotion blowing everything away. In shock with her left arm hanging down because it was broken, she was amazed that Pein blew everything away and did not even have a scratch. After having a full battle with him Sakura has figured out his powers. Its as if he can control gravity and all to push and pull anything and one he wants to. Sakura spotted Pein running towards her as her first reaction was to set the tag on her kunai on fire, as she did. All of a sudden a flame was set at the tip of her tag when Pein entered the building blowing it to pieces. Easily avoiding the boulders she knew it was for destraction. Turning her head she spotted Pein besider as she went to go stabb the kunai with the exploding tag. But Pein acted faster kicking her right in the gut where she had been stabbed. This gave Sakura so much Pein that her mouth opened wide and her hand opened dropping the kunai to the ground. Beeing catapulted away by the force of the kick, the next thing Sakura heard was an explotion as it would have been the exploding tag which was right under Pein. Sakura would smash against the floor coming to a sliding halt. Slowly getting back up holding her wound because it was hurting like hell now, she started healing it once more. Spitting out blood onto the watery floor, she waited to see what Pein would do, because there was nothing more Sakura could do. The Akatsuki leaders kick connected with the females body and instantly hit her away with his amazing strength. 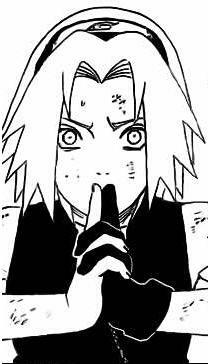 Looking down at the ground as his aw with his Reingan eyes that Sakura dropped something that seemed to be lighting up. But by the time Pein realized what it was, he wasnt able to do anything. The explossion set off right infront of Pein creating an explossion of fire and smoke hitting Pein away with a sudden feirce push. Pein smashed into a building sending tiny cracks across the wall from where he connected with it. Landing onto the ground but remaining on his feet, the explossion and burt the whole front of Pein's cloak and his chest was almost ash black. Slowly pushing himself off of the building Pein would say to himself "Damn her. How could she have lasted so long?" The rain the continued to fall from above would indicate the God of Sakura's position. Looking up into the rain letting it wash away the dirt in his face, he would look back down to the location were Sakura was situated. Still holding the two blades one within each hand, Pein would jump off of the ground onto one of the buildings lokcated in his village. Looking right down at Sakura Pein said "You are a stronger opponent then I had anticipated." Before he finished his sentence, Pein would activate the Bansho Tenin. But this time adding so much more chakra into it that the force of the pull felt like a tornadoe had just landed infront of Sakura and she was being sucked right into the monstracity. "But everyone must fall." As Sakura came towards Pein at an increasingly fist rate, the Akatsuki leader swung both arms inwards releasing both of the black blades which he held. Releasing that at a prety fast rate and adding that onto the high speed that Sakura was travling at, both blades would rip right through Sakura's body the instant they made contact and entered her flesh. As they came bolting out behind Sakura, the dagger like blade went through Sakura's right shoulder and the bigger blade stabbed right through Sakura's left lung also slashing through a couple veins and arteries connecting to her heart. Sakura would continue forward heading strait towards Pein. The second Sakura got into Pein's range, the God swiftly swung his right fist fist forward smashing his powerful fist right into Sakura's stomach hitting her all the way back down to the ground like a bullet. Sakura was still healing her wound as she noticed Pein had been sent flying away by the explotion. This bright Sakura's hopes up just a bit, but she knew that it would mean nothing because she stood no chance what so ever. But she was putting up a fight for the so called Akatsuki leader Pein, somthing she never thought she could ever acomplish. Seeing Pein aproch from another building, Sakura got ready into a stance keeping her hand on her wound healing it. Out of no where Sakura felt her body shaking like never before knowing Pein was pulling her with his jutsu. Within an instant her body lunged forword at such a high speed towords Pein. She was moving so fast she could barley keep up with her site around her. Seeing the two blades placed infront of Pein, she tried to react but was moving to fast and before she could do anything, both blades stabbed into her. One in the shoulder and one in the lung. When getting punched in the stomach, she rapidly grabbed onto Pein's elbow as tight as she could not heading away. Since her lung had been punctured, she would use the last of her breath to say one last thing. Whispering to Pein she would say " Your right, and one day you will fall yourself......." as her grip losened off of Pein as she fell down onto the roof top. She had died from both lose of air and lose of blood. In the end, Sakura gave it her all and had a slight chance of winning, but it sliped away. The blades had gone right through Sakura, nd the minute this happened Pein knew he had finally won this battle. His powerful fist thrusted forward right into the frame of Sakura, but somehow, she still had the strength to grab onto Pein even after being struck with such a powerful blow. Pein listined to the last words of the kunoichi when suddenly her body died and she flopped onto the rooftop of his building. Looking down at the motionless corps as blood oozed out of her wounds Pein would answer back "But not today." As the rain fell down and washed away the blood that resided on both Pein and Sakura, the God would vanish from his war torn village.